Nanuk was a ton of fun while we were playtesting it. Some of the best games I participated in were during our "upper limit stress test" sessions, when we gathered as many people as possible to try to break it. Eventually we settled on eight as the official maximum number of players, but fun was had even with a dozen hunters sitting around the table. Personally, I'm hoping to get a couple of "over the limit" games in during PAX East later this week. Smack talk is fine and all, but when you're trying to convince a dozen people that 7 fish in 2 days is totally possible . . . that's a good time. I've heard rumors of groups taking the cards from two games to get groups upwards of twenty players. While we can't Officially Condone such crazy behavior, I would love to hear about it! 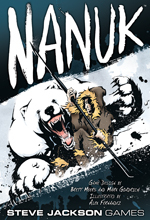 Tell us about your biggest game of Nanuk on Twitter (we're @sjgames) or on our forums.